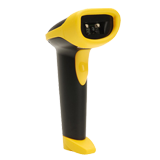 The Wasp WLR8950 barcode scanner delivers flexible, long range scanning paired with durable construction. 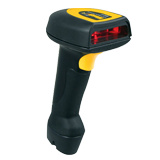 Easily read 1D barcodes up to 12” away using the WLR8950’s long range scan engine. The WLR8950 features high-quality ABS plastic construction and pistol grip design for comfortable use in any environment. Use the WLR8950 barcode scanner to improve efficiency and eliminate data entry errors in retail, healthcare, office, manufacturing, and warehouse environments. For fast connection, simply plug the WLR8950 into a keyboard wedge through a USB or PS2 cable and begin scanning colored barcodes using the bi-color, dual LED light source. The WLR8950’s bi-color technology automatically changes light sources between green and red enabling you to decode a red barcode using the green light and green barcode using the red light. For tough to read barcode labels, the WLR8950 can easily scan barcodes with a Print Contrast Ratio (PCR) as low as 30%.